While I am away on the Low Carb Cruise I have reached out to some of my favorite low carb or Paleo bloggers to share some delicious recipes with you. 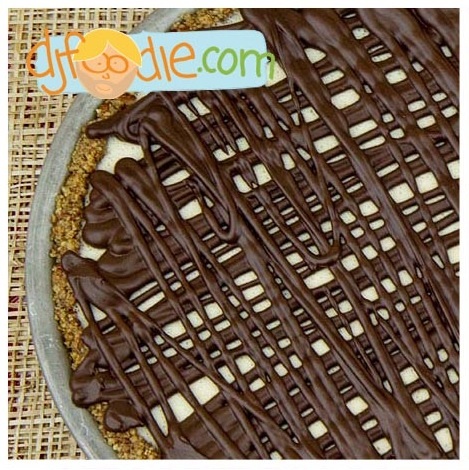 Next up is my friend DJ Foodie, with a two part guest post explaining how to make low carb nut crusts for pies, caramel flavor, a delicious recipe for Salted Browned Butter & Pecan Pie, plus so much more! Please welcome DJ Foodie and enjoy his guest posts. First, we’ll get into the nut crust. Nut crusts are an incredible way to go. Sure, I’ve had people complain and lament that they miss their tender flakey crusts. I get it, but I also recognize that nut crusts are texturally interesting and delectable, in their own right. They’re also just about impossible to mess up! If you take about 1 1/2 cups of any just about any kind of nut, and pulverize it, then mix it with 1/4 cup melted butter, you’ve got a solid crust. Simply push the “dough” into the base of a pie pan, pre-bake it and fill it up. What results … is a pie, by every definition I know! Sure, it’s a little on the crumbly side, but it’s absolutely scrumptious, you can slice cleanly through it, it provides plenty of structure, it lends a pleasant texture and looks fantastic! I’ll often add seasonings to it, perhaps a dash of salt, a dribble of vanilla and even 1 tbsp of honey to help “bind” it. Yep! 1 measly little tablespoon of honey, spread across 8 or so slices of pie doesn’t add much in the way of flavor or carbs, but it DOES help to keep the crust in one piece. Have you ever touched honey? It’s sticky! The sugar acts like a “glue”, binding it all together! Nuts I’ve tried: Pecans, walnuts, coconut, peanuts, macadamias, almonds and hazelnuts. One of the strangest aspects of this is, smashing the nuts myself tends to yield the best crust! I really don’t know why this is, but … it is! I’ve tried pulverizing the nuts in a food processor. This works well and is quick! I’ve tried using pre-ground meals and flours. This is also quite easy to do, but is a little more costly. Each of these methods results in a nice and even crust, but it tends to be crumbly and doesn’t hold together quite as well. For a crust that really seems to “hold its own”, oddly, the best method is to take whole nuts, chop them a bit, then place them in a large bag and whack at them with a rolling pin, mallet or the bottom of a pan. It’s just as good for crust making as it is for releasing stress! Just whack the bag until the nuts are evenly pulverized, but not “butter-fied”. Coconut Note: Coconuts don’t really pulverize like the other nuts. I’ve found this to work as a pure layer of compressed coconuts with a little honey, but it does work best blended with another nut. I have tried flaked and grated coconut, but I have not tried coconut flour. My guess is that this would require a completely different method. There is a very distinct flavor that comes from the slow methodical burning of sugars. A deep and complex essence rises from the otherwise clean, clear “sweet” of pure crystalline sucrose. How would one go about achieving a similar flavor, but without sugar? This question vexed me for a while, but then it hit me one day. BUTTER! You can brown butter, which will give a similarly deep and rich flavor, but without all the carbs! The problem with butter, unfortunately, is that it’s almost all butter fat! This isn’t a problem from a macronutrient standpoint, but one of the “stuff” within it! Butter is approximately 80% butterfat, 16% water and only 4% “stuff”. The “stuff” (generally referred to as “milk solids” or “serum solids”) is where the flavor lives! That mixture of tasty goodness is made of lactose (milk sugars), caseins, whey proteins and minerals. For the purposes of our pie, it’s only the milk solids that we want to caramelize. With such a tiny overall percentage it’s going to take colossal amounts of butter to make our pie taste like anything but straight up glorious butter! One option would be to take a mountain of butter and cook it until the water completely evaporates. You can pour off the rest of the butterfat and use it for cooking. It’s clarified butter! What milk solids remains at the bottom of your pot can be further browned for yummy awesomeness. Unfortunately, this is a mammoth feat and totally unrealistic, unless you’re a restaurant with a full staff and a major need for ghee. Another, far more realistic approach would be to brown CREAM. Butter is made from cream after all, is it not? Just churn the stuff and you’ll get butter! AHA! If you take cream and place it on the stove over very low and patient heat, the water will eventually evaporate. Again, we will be left with a mixture of butterfat and milk solids. However, THIS time, the ratio is stacked MUCH more in our flavor. Cream has about 3 to 4 times the milk solids, but near double the water. If you eliminate the water, your new ratio is about 7 to 8 times the milk solids to butterfat. MUCH better! WHOO HOO! Caramelizing these milk solids and then sweetening them with something such as “Swerve” will render a tasty caramel flavored concoction! Here we’re going to get deeper into the scientific fun! Have you ever heard the phrase “Cream rises to the top?” This is because cream is mostly fat, which has a lower density than water. This means it weighs less than water, by volume. As a result, it floats to the top, much in the same way oil floats above vinegar. It doesn’t want to mix, or stay put. Most creams purchased in the store are “homogenized”. This means that the cream can no longer rise to the top! The homogenization process, a high pressurized process pushing milk/cream through small tapered tubes, shrinking the fat globules, creates a colloid emulsion. The end result? The tiny little globules of fat have been evenly dispersed and distributed within the “water”, creating a smooth and consistent cream, which will never separate. Mayonnaise is another colloid emulsion; it occurs when fat is whipped with water and eggs. “BREAKING” an emulsion is the term cooks and foodies use for screwing up a mayonnaise, buerre blanc or hollandaise sauce. It’s usually followed by throwing a pan, stomping around and swearing a lot. It’s SO easy to do! Most of the time “breaking” an emulsion is a bad thing, because getting the emulsion to start can be such a pickle! Not this time. We WANT to break the cream! At this point, you’re probably asking yourself why I’m going through all of this. Two reasons! In order for us to make our brown butter pie with cream, we’re going to need to break the cream’s emulsion. We need to break it, so that we can caramelize the milk solids. Then, we’re going to re-emulsify it, with eggs and more homogenized cream! There is a method to this madness! Store bought heavy cream is emulsified by engineered machines. It is designed not to separate, which makes this process a little strange. If you take a stick of butter and melt it, the emulsion breaks immediately. Breaking a store bought cream requires time and patience. The first step? Put cream on the stove! Cream has a tendency to sit there, getting hotter and hotter, looking back at you with docile innocence, until you look away. When you least expect it, it will rage up in a bubbling frenzy of white foam, flowing over the edge of your pot and making a big mess of your stove. You know it’s true. Pesky cream! To stop this from happening, place a wooden spoon across the top of your pan. When the frenetic cream hits the spoon, it will immediately calm down and settle to the bottom of the pan. I also suggest bringing the cream up to a boil, slowly. Once the cream is up and simmering, just let it gurgle away for a while. It can take a good hour or two, but, in my own personal opinion, it’s worth it! The end result of these steps really is something almost magical. Reduce the cream (evaporate the water out of it) until it breaks and starts to color. DO NOT burn it. There’s a point at which it’s too dark and becomes bitter. Look for something that resembles a nice “sand at the beach” (floating in yellow butter fat). Much darker than a nice sandy color and it gets bitter. Too light in color and … the flavors are not developed as well as they could be. It’s a very fine line! It should be light brown/tan. Once it’s like little pebbles and the color of sand at the beach, set it aside. Keep it warm, but not “hot”. We now have the basis for our caramel flavor, via a browned and broken cream emulsion. We’re cooking now! Stayed tuned for Part 2-Gelatin, Chocolate Ganache, and Salted Brown Butter & Pecan Pie which will be posted on Wednesday (May 8th). You’ll finally get the recipe for the delicious Salted Brown Butter & Pecan Pie with Chocolate Ganache!